For Immediate Release: Posted On 4/11/2012 By Industrial Magnetics, Inc.
Industrial Magnetics, Inc. has introduced a new design for their Manhole Cover Lift Dolly used to quickly, safely and magnetically remove & replace heavy, steel manhole covers. The new design incorporates an arched hinge bracket and rubber spacer that reduces possible pinch points when collapsing the dolly for storage or transport. The Manhole Cover Lift magnet and dolly system is an ergonomic lifting solution, minimizing stress & strain on the back and body while protecting the user from crushed toes, feet or ankles due to accidental dropping of the load. 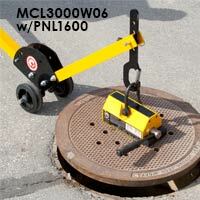 View the Manhole Cover Lift System online, or contact IMI’s product specialists at 800.662.4638/231.582.3100.